Definition at line 443 of file ketypes.h. Definition at line 447 of file ketypes.h. Definition at line 454 of file ketypes.h. Definition at line 456 of file ketypes.h. Referenced by KeInitThread(), KeWaitForGate(), and KeWaitForMultipleObjects(). Definition at line 457 of file ketypes.h. Definition at line 453 of file ketypes.h. 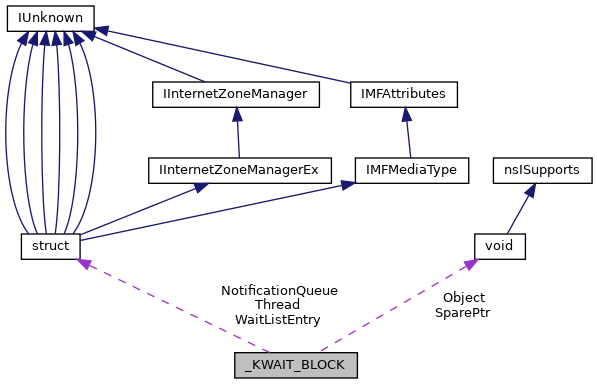 Referenced by KeSetEventBoostPriority(), KeSignalGateBoostPriority(), KeWaitForGate(), KiActivateWaiterQueue(), KiInsertQueue(), KiWaitTest(), KxUnwaitThread(), and KxUnwaitThreadForEvent(). Definition at line 448 of file ketypes.h. Referenced by KeInitThread(), KiWaitTest(), KxUnwaitThread(), and KxUnwaitThreadForEvent(). Definition at line 444 of file ketypes.h. Referenced by KeInitThread(), KeRemoveQueue(), KeSignalGateBoostPriority(), KeWaitForGate(), KeWaitForMultipleObjects(), KeWaitForSingleObject(), and KiUnlinkThread(). Definition at line 446 of file ketypes.h. Referenced by KeInitThread(), KeSetEventBoostPriority(), KiWaitTest(), KxUnwaitThread(), and KxUnwaitThreadForEvent().